Thom Mayne and his firm Morphosis designed a 353,000 sq. ft. student recreation center on the campus at the University of Cincinnati, which opened on May, 2006. Rebeca Méndez was commissioned to create a public art installation on four cone-like structures, two of them reaching over 50 feet high and piercing through the roof. 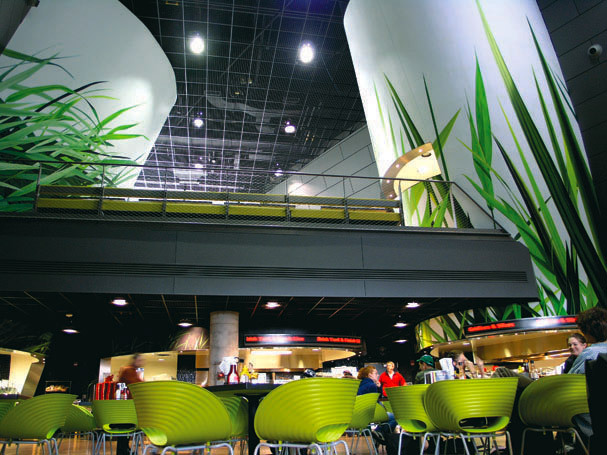 The cone structures envelop the kitchens of the food court, and hide all the piping and machinery necessary for such enterprises. What often happens in spaces like these is that the occupants fill them with evergreen ficus trees to liven up the interior, often leading to dreary, dried out dust collectors dying in a lonely corner. Permanent flora printed on the cones, Morphosis imagined, would avoid this tragic fate. Méndez and Mayne discussed D’Arcy Wentworth Thompson’s seminal work On Growth and Form (1917), which posits that processes in nature fit mathematical equations, setting out to prove a unity of life by its relationship between form and function. To expand on this, Méndez studied Stephen Wolfram’s book A New Kind of Science (2002) where he states that repetitive application of simple computational transformations is the true source of complexity in the world. 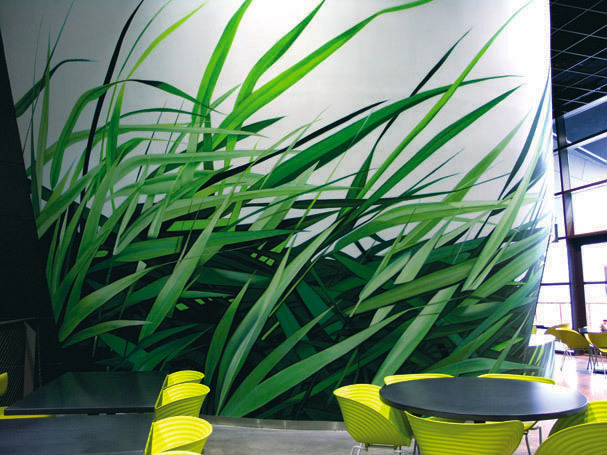 Méndez’s investigations into how to create a visual dialogue between flora, the architecture, and the site led her to select grass — specifically giant reed grass — for her art work. Over many months and continents, Méndez photographed grass from various points of view and under the different weather conditions allowing light and wind to create visual difference, and to reveal the patterns that one simple form — a blade of grass — produces through complex organization.